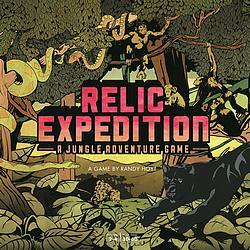 Relic Expedition is a jungle exploration game. As players explore, new tiles are revealed and the board grows in unpredictable ways, making each game different than the last. Players need supplies to survive the dangers of the jungle as they race to find valuable relics. They carry both together in their backpack, but backpack space is limited. As the game progresses, players must make tough decisions about which relics to keep — and which supplies they can live without. The first player to collect a set of four matching relics and fly away from the jungle wins the game.